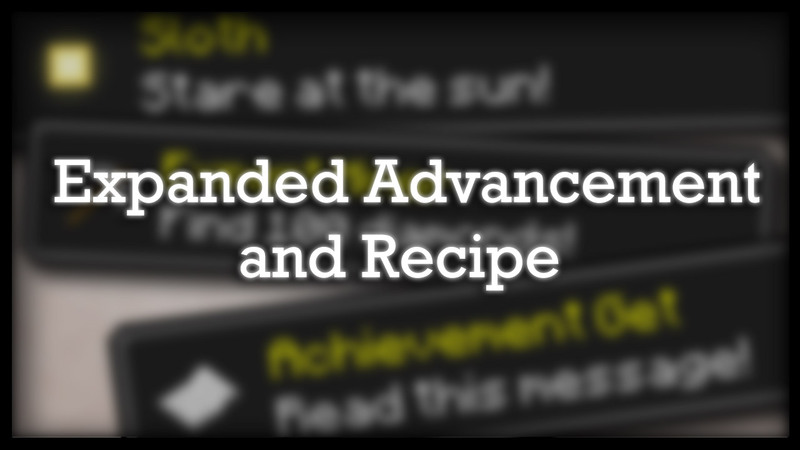 Expanded Advancement and Recipe Data Pack adds 303 advancements, 13 tabs and a lot of recipes to your world. Some advancements are new, some are remakes of old achievements, and some are exclusive from Minecraft Bedrock and console version. You can check the list below for more detail about this pack. This tab has been completely disabled, with all the advancements being repurposed in other places. This tab contains 16 advancements which revolve around building, light, and display. This tab contains 14 advancements revolving around Minecraft’s underground environment. All advancements in this tab are custom. This tab contains 20 advancements revolving around combat and monsters. This tab consists of 43 advancements revolving around exploring, structures, and biomes. This tab contains 16 advancements which revolve around trees and wood. This tab consists of 20 advancements revolving around farming, plants, and food. This tab contains 27 advancements which revolve around the Nether, potions, and beacons. This tab is the largest, with 43 advancements. These aim to reach every corner of Minecraft’s underwater environment. This tab consists of 19 advancements revolving about redstone and redstone components. This tab contains 20 advancements revolving around the End dimension. This tab of 16 advancements revolves around collecting all the colours of many materials. Just a minor polishing update with very few changes, I’m saving most things for 1.14. Check out the no recipe version down below if you’re interested!